Prince Charles and the Duchess of Cornwall have begun their US tour by paying their respects at Ground Zero. The royal couple then inaugurated the British Memorial Garden for UK victims of the 11 September attacks. After meeting families of British victims, Prince Charles said he and his wife had been moved by what they saw. The prince is also visiting UN Secretary General Kofi Annan at the New York headquarters as part of the American tour. The royal couple's eight-day stay also includes visits to New Orleans, Washington and San Francisco. The trip is Prince Charles' and Camilla's first joint official overseas tour since they married. They were met at Ground Zero by New York Governor George Pataki, British Consul General Sir Phillip Thomas and Kenneth Ringler, the executive director of the Port Authority, which owns the site. Hundreds of well-wishers met the royal couple at the British Memorial Garden where the prince unveiled a dedication stone. After meeting relatives of some of the British victims near the garden, Charles said: "Both my wife and I are profoundly moved by what we saw, not just the scale of the whole outrage but the deeply distressing individual stories of heroism and loss. "In the four years that have passed the sorrow is not lessened. "Our hearts go out to you and also to the families of the New York fire and police departments who sacrificed their lives." Talking about the memorial garden, Charles said: "Both our nations have been united by grief and strengthened by the support we have given each other." As a sign of that unity, the Union Jack was flown alongside the World Trade Center flag for the visit. On Wednesday the pair leave for Washington, where they will dine with President George W Bush. And they are expected to meet those affected in the hurricane-devastated Louisiana on Friday. In Washington, they will not be staying at the White House. During their three days in the city, the prince will also lay a wreath at a World War II memorial to commemorate the 60th Anniversary of the end of the conflict. The Duchess of Cornwall and Prince Charles will visit a farmers' market and lunch at an organic farm in Marin County. Last week, he also spoke out on climate change, and he will give a speech at a seminar on environmental issues, while in San Francisco. BBC royal correspondent Peter Hunt said the trip was a "high profile visit which will test to the full Camilla's transformation into a senior member of the British Royal Family". Bob Colacello, a special correspondent for Vanity Fair magazine in the US, told the BBC he believed the couple would be well received. "If they are as effective with crowds as I saw them to be when following them around London and Yorkshire for a Vanity Fair article, I think they'll win over the American," he said. He said Americans were interested in the couple. 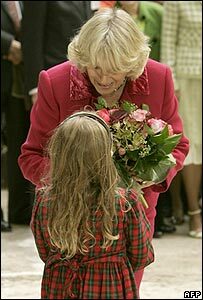 "I think here in America people are curious about Charles, and Camilla especially," he said. "The curiosity turns to warmth when people actually see them together."